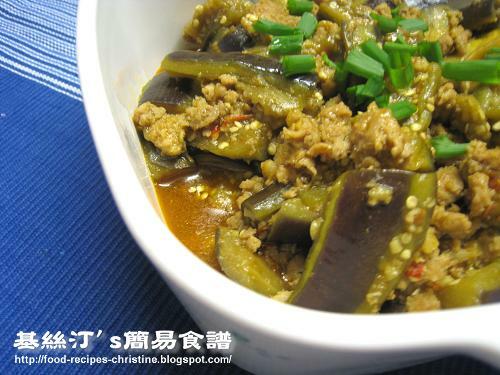 This popular Chinese dish, Spicy Eggplants with Minced Pork (魚香茄子) is always in our family’s menu. Although I can easily get very big eggplants here, when it comes to cooking this dish, I like to use the smaller ones, purple in colour, with a slim and long shape as well as soft skin. Having said that, no matter what kind of eggplants you choose, this dish would definitely be delicious. The spongy texture of eggplant absorbs all the flavours and sauce, giving you a heavenly taste. Some people might not like its bitter taste. But if the sliced eggplants are rinsed with salty water before cooking, this step will help remove much of the bitterness. More importantly, the eggplants should be cooked thoroughly. Rinse eggplant. Trim and julienne as picture shown. Soak in water with a bit of salt dissolved for a while. Drain well. Marinate pork mince for 20 minutes. Heat 2 tablespoons of oil in a clay pot over medium. Sauté half of the minced garlic, shallot, ginger and chili bean sauce. Add eggplant and stir fry constantly. Also add hot water bit by bit all the way of stir frying. Don’t add too much water at a time, just add small amount to avoid burning or sticking to the bottom of clay pot. Coat the eggplant with sauce evenly, then add some boiling water to simmer until eggplants softened. While stir frying the eggplant, use another frying pan to heat some cooking oil. Add another half of minced garlic, shallot, ginger and chili bean sauce until aromatic. Add pork and stir fry until cooked. 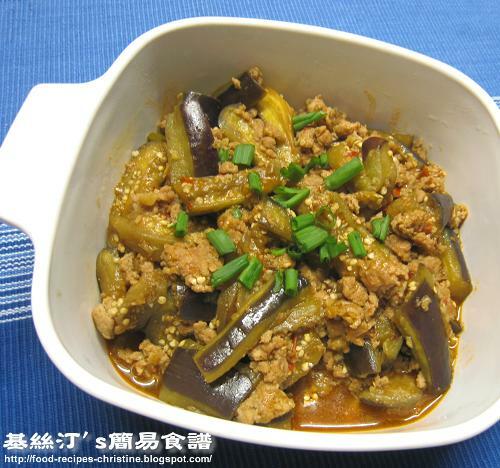 When the eggplant is softened, toss the minced pork in clay pot. Stir fry quickly. Turn heat to medium. Add seasoning and continue to cook. Bring it to boil. Add thickening to your preference. Serve hot. It’s not necessary to soak the julienned eggplant in water with salt. But this step would help to remove its bitterness and keep its purple colour fresh from cooking. Or simply peel off the skin instead. MMMMMMMMMMMMMMMMMMMM,...the food sounds tasty & a must try!! I love aubergines ( eggplants & they are in seaon now, so a must try recipe!! Many of my friends love this too. Great! Would you cook this dish for your lover then? I love aubergines. This dish looks really nice. The recipe looks very good. I remember my mom always cooked for us. It was one of my mom's favourite dish. Looks delicious, especially spooned over rice! i m a beginner at cooking n i luv your recipe! U mentioned "•water, adjust while cooking" "Don’t add too much water at a time" "bring it to boil"
Thanks. Did you try this before? Yeah, it's a traditional Chinese dish, really go well with rice too. The tasteful sauce is great for white rice. No problem. I'll walk you through. When you sauté the minced garlic, shallot, ginger and chili bean sauce together with the eggplant, you have to add water bit by bit because they are easily burnt in a clay pot. So how many water would it be? It might be measured by teaspoon. Add about 2 teaspoons of water at a time at this stage. Just to keep the ingredients moist and not burnt easily. When you smell the aroma of all ingredients, and the eggplants are well coated by sauces, you can add more water to cook the eggplant then. At first, add about 2/3 cup. When water is vaporized and not enough, just fill in some more hot water, not cold water. 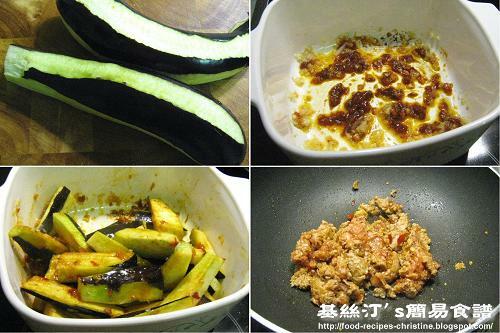 Continue to cook until the eggplant is softened. You might wonder how much water you need to cook the eggplant. It depends on the power of your stove and how long you cook. So you have to keep an eye on them while cooking. Don't leave them unattended. This dish is one of my favorites, and now I have the recipe - yeah! Thank you for posting all these wonderful recipes. I live in the States but grew up in HK and it's hard to find authentic food around where I live. I made this the other night and it was so yummy, made me feel like I was home again. Thanks so much! Can I use something besides a clay pot? I don't have one. Also, I thought clay pots were more used in the oven and not over the hob? Yes, you can use wok or any pots to cook this dish. It tastes good too. I cooked it yesterday with a great appreciation from my family, a singles friend and another friend, a lady from Tuscany. It was really delicious, even if not too hot because of family tasting. Hi Christine, this recipe looks great! I'm going to make it tomorrow. I have a 3 year old and he won't eat chilli so do you think soy bean paste is a substitute for chilli bean sauce? If not, what should I use? Sure, you can tweak the recipe with soy bean paste to suit your family. This recipe calls for ginger root. If you don't have any, I recommend you skip it, only losing some spicy, hot taste. If possible, try to get ginger root for the best result.